Brighton is a town on the south coast of England, just under 100 miles from London. Since the arrival of the railroad in 1841, the city attracts tourists, who go to spend the day or a season near the ocean. In recent years, have been considered one of the most beloved beach destinations in the UK, and it is not rare to see the adjectives "trendy", "cool" and "hip" to the name of the city. So if your stay in the land of the Queen you should pay a short visit to the coast! Brighton is not your normal sand beach. It is a pebble beach! And as the weather is not always the best and you can not rely on the sun even at the height of the English summer, you need to have fun. In the case of English seaside towns, the fun usually comes in the form of a pier, where they are installed bars, restaurants, and an amusement park for children. 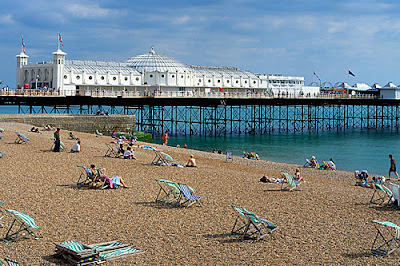 The Brighton Pier, a beautiful structure built in the Victorian era, ties it all together. Another important point is the promenade, a boardwalk to the seaside. You can walk to the Brighton Marina, a very nice place with many bars, restaurants and shops. Ever tried "fish and chips"? Take a vantage of the sea just a few meters away and savor this typical British dish. There are several good choices, including the Bankers and Bardsleys, the second elected by a British newspaper as one of the 10 best places to have a fish and chips in the UK. Royal Pavilion - summer palace built for the Prince Regent (who became King George IV) transformed by the architect John Nash in the early nineteenth century in one of the most exotic buildings in Britain. The Lanes - on the outskirts of the Royal Pavilion, a series of charming narrow streets and alleys that were the center of the small fishing village, are today the home of independent shops, boutiques and antique shops. Brighton Sea Life - right next to the pier, it is impossible not to see this aquarium that is home to over 1500 species, and that is, according to the website, the oldest working aquarium in the world. 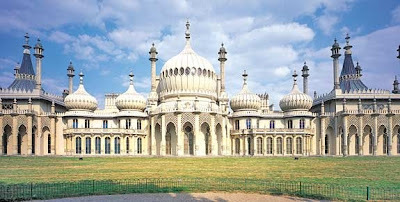 Museums - in the gardens of the Royal Pavilion is the Brighton Museum & Art Gallery, and the city also has a museum of natural history, the Booth Museum of Natural History. There is also an interesting toy museum, the Brighton Toy and Model Museum. How to go from London to Brighton? The train ride lasts about 1 hour and there are two options: trains from Victoria station and London Bridge station. Cheap round trip when bought in advance are priced from £16.00. See schedules and prices here. Here's the map of central Brighton.